Previously, we touched upon the importance of helping our children learn Arabic. But if you don’t speak Arabic yourself, that task is easier said than done. Not only is Arabic hard to pronounce for those of us who did not grow up speaking Semitic languages, it also has a complex grammar. So what are we suppose to do if we haven’t quite acquired the skill sets needed to impart this crucial knowledge? Even if you don’t know Arabic, you can start by taking it one step at a time, and by building the foundation brick by brick! 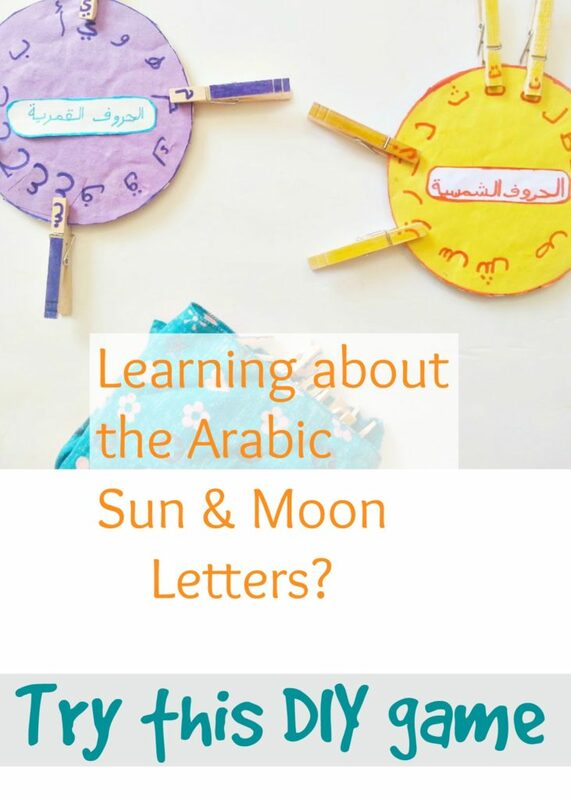 You probably have heard that the Arabic alphabet consists of 2 sets of moon letters and sun letters. It is important to learn which letters fall into which category to aid with proper pronunciation. While thinking about how I can help my children memorize which letters fall into which categories, I came up with a quick, and fun game, which was so easy to make and costed me only about a buck (can’t beat that!). Since I also had my kids make it themselves, it was relatively effortless ;). InshaAllah, we will be sharing more Arabic Learning Materials, so check our blog frequently for more “building blocks”, or subscribe to our email list (at the bottom on the page) to get an update! 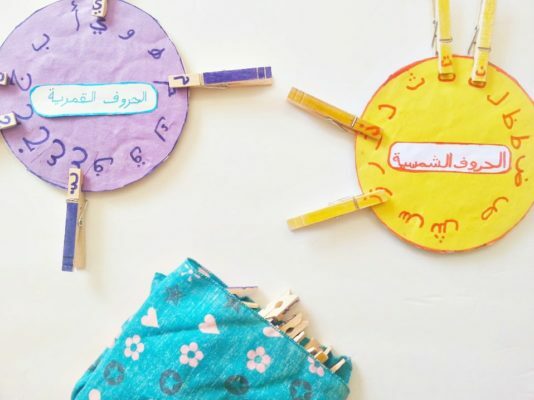 Using a plate, or other circular object, trace a circle on a cardboard, and construction paper (use colors to coordinate with the pins), and cut it out. Glue the yellow colored construction paper circle onto the cardboard circle, and write the sun letters around them (tip: you may choose to write in pencil first and trace over with a marker later). Do the same for the moon letters on the other circle. 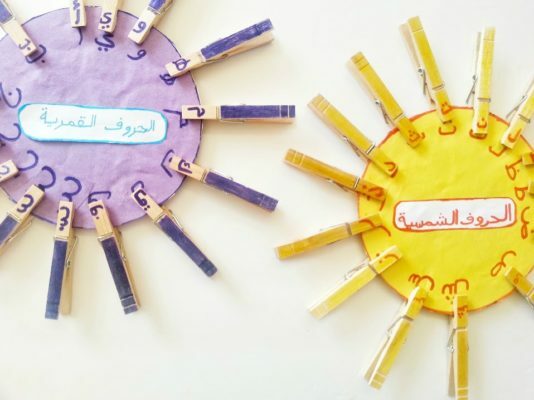 Optional: You can choose to make a label, الحروف الشمسية (al-huroof ash-shamsiiyyah) which means sun letters and glue on the center of the yellow circle. Likewise, you can label the “moon circle” with الحروف القمرية (al-huroof al-qamariiyyah). A useful tip you can teach your child is that the sun letters are typically pronounced at the front of the mouth while moon letters are often times pronounced at the back. Note: Only 2 players or teams can play this game at a time. Place all the pins in the bag, and give a sun card to one player, and the moon card to another player. The players will take turns picking a pin from the bag. If it is a letter from their card, they can pin it on. Otherwise, they have to put it back in the bag, and the next player will then pick. The winner is the first person to pin all the letters on his/her card. It’s that easy, but it will help make the memorization process much more fun! Do you have any Arabic learning games you can share? InshaAllah, comment below, so we all can learn from each other 🙂 Jazakum Allahu Khair! MashaAllah. What a great idea. My son is really interested in learning Arabic and I am not an Arabic speaker. We would both learn, inshaAllah. MashaAllah, It’s so beautiful when the whole family learns together 🙂 InshaAllah, an advantage you will find is that as you are “teaching” your son, you will be picking things up really fast yourself.